Last week I talked about going to a baseball game in Hiroshima. 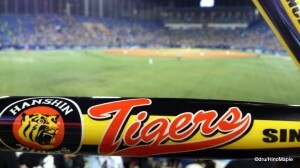 I had watched the game between the Hiroshima Carp and the Yakult Swallows. Upon my return to Tokyo, I realized that I hadn’t been to a Hanshin Tigers game in about a year. The last time I went to a Tigers game was almost exactly 1 year ago. I picked up tickets the day before the game and headed out to what may be becoming an annual event for me. 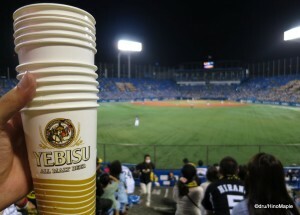 If you have never been to a Hanshin Tigers game, it is one of the craziest games you can imagine. Hanshin Tigers fans are some of the most crazed fans in all of Japan and the team is often likened to the Red Sox while the Yomiuri Giants, Tokyo’s top team, are likened to the New York Yankees. If you want to read more about the Tigers and the Swallows in general, you can read about it in my past posts from the times I went to games in 2008 and 2011. Being somewhat used to going to baseball games, I arrived about an hour before the game and headed towards centre field. I found some seats near the press gallery and set up shop. With an hour to go before the game and the sun still relatively high, I regretted that I forgot to bring sunscreen, but with only a little time before the sun went behind the surrounding buildings, it wasn’t a big problem. I was also better prepared for this game than previous games. I made sure I stopped off at my local supermarket to get enough food to last the game. I started into the beers right away and my final count for beers was about 6 by the end of the ninth. Just a little much, but when you are having so much fun in the game it is hard to stop. The pregame antics didn’t get under way until about 30 minutes before the game started. The cheer leaders came in around 40 minutes before the game started and handed out little cards to help us sing along to the songs for each of the players. Note that they are not cheerleaders as these guys are not there to entertain us but to help us to know which cheer to sing at which times. At 30 minutes before the game, the cheer leaders led everyone in the Tigers Song before going through the starting lineup player’s songs. Once the game got started, everyone was cheering along and by the second inning, the Tigers were up 1-0. It was the only exciting thing to happen in the first half of the game and a good way to open as well. There is nothing like the team you are cheering for to get a quick run in the beginning of the game. The rest of the game was pretty boring until the seventh inning. 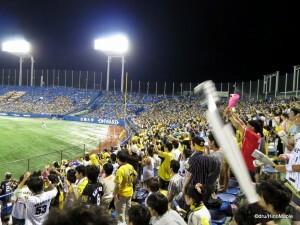 As usual, the Hanshin Tigers fans erupted into the Hanshin Tigers Song to cheer on their team. After the top of the seventh ended, the Yakult Swallows started to sing their song which meant the Tigers fans took over as well and sang their version of that song in which they deride all of the other teams in the league as well. After the seventh inning, the Yakult Swallows tied the game at 1 each. From there, the Tigers played their hearts out in the ninth inning. 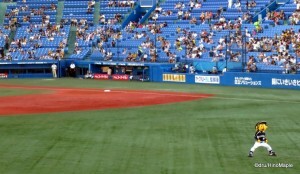 It was a very long inning for the Swallows as the Tigers were able to score 6 runs. It was one of the most exciting games I had been to for the ninth inning alone. During the game, the Tigers fans went into cheers of excitement after every run followed by a singing of the Tigers song. Try doing this 6 times in a row and you get the idea of how much fun it can be. Suffice to say, the Tigers won the game and being with the other fans, the crowd was elated. Perhaps it was my luck as they also won last year when I went. Now that the game summary is out of the way, the main purpose of this post is to highlight the songs of the Hanshin Tigers. The songs they have are very hard to sing to if you are not familiar with them, or Japanese for that matter. They often have special songs for the main players of the team, generic songs for other players, and of course their own theme song. I wish I knew the songs before going to the games in the first place and even now it is difficult to catch them all but here is a quick primer into some of the most important songs. The Hanshin Tigers Song is the most important song that you can learn. It is the rally cry to get people into the game and it is sung after the top of the seventh for home games and before the seventh inning for away games. With everyone belting it out, it sounds much different than the official sound of the song. You can also watch the version I put on YouTube myself. Note, during games they usually just sing the first verse. Basically, if you want to learn all of the cheers, you can visit 2012年度　阪神タイガース応援歌 for all of the songs for the main players. All of the songs are all played a little slow so it isn’t the same as going to a live game when the tempo is increased. 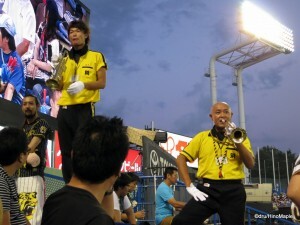 It is a good way to learn the songs if you ever want to become a real fan of the Hanshin Tigers. For myself, I’ll be happy to learn just the end and clap along with the other fans. In fact, I bought my own first pair of plastic megaphone clappers so I guess I have to go to more and more games of the Hanshin Tigers. When visiting a baseball game in Japan, it isn’t important to know how the game is played, but it is important to keep up with the crowd. Screaming with the crowd and cheering for the team is one of the best ways to have fun. The beer helps too but it isn’t necessary. Most of the Tigers fans are not heavy drinkers, but they may look like it. They love their team and will cheer enthusiastically until they finally win that championship. Unfortunately they may never win the championship as they still seem to be cursed. Perhaps in a couple years they will make it to the top and win in the playoffs but being near the bottom of their league and unlikely to move into the playoffs, I highly doubt it. There is always next year and I’ll definitely go to a game again. It is a great thing to do in the summer, even if it was a bit expensive. There really is no price for having fun. This entry was posted in Baseball and tagged baseball, Hanshin, Hanshin Tigers, Hanshin Tigers Song, japan, Jingu Stadium, Meiji Jingu, Meiji Jingu Stadium, Nippon League, Nippon Professional Baseball, NPB, Swallows, Takashi Toritani, Tigers, tokyo, Toritani, Yakult, Yakult Swallows by Dru. Bookmark the permalink. 1) I love the videos! 2) That is a very impressive Final Beer Count! Thanks for the official translation. Kinda strange but not bad. Hopefully I’ll be in Kansai sometime in the future to watch a game down there. If I take videos, it would be crazy! I think I have commented elsewhere on your page about your reports – great stuff! Thanks for dropping by T-Ray! PS: Love your site. Need to look a bit more but it’s a lot of fun.